Carl Maria von Weber, composer, pianist and conductor, was born on November 18, 1786 in Eutin, Germany and died on June 5, 1826 in London, England. Although he lived in the Classical Period (1750-1825) in music, Weber is usually referred to as the father of Romantic Period (1825-1900) German Opera. His first cousin, Constanze Weber (1763-1842), was married to Wolfgang Amadeus Mozart (1756-1791), who had originally courted Constanze’s older sister Aloysia Weber (1760-1839). Weber’s father, Franz Anton Weber (1734-1812), a violinist and bassist, had hoped Carl Maria would also become a child prodigy, like Mozart, however, such was not the case. Franz Weber directed a travelling theatre company in which Weber’s mother, Genoveva (1768-1798) was a singer; consequently, Weber’s first major work was an opera, Das Waldmadchen, written in 1800, when he was 13 years old. Eight years later, Weber wrote another opera on the same subject, Silvana (1808-10), from which the theme in Variations (Op. 33) is taken. Most of the major works for the clarinet have been written for friends of the composers: Johannes Brahms (1833‑1897) wrote his Trio, Op. 114 (for clarinet, cello & piano), Quintet, Op. 115 (for clarinet & strings) and two Sonatas, Op. 120 (for clarinet & piano) for clarinetist Richard Mühlfeld (1856‑1907); Mozart wrote his Trio, K. 498 (for clarinet, viola & piano), Quintet, K. 581 (for clarinet & strings) and Concerto, K. 622, for clarinetist Anton Stadler (1753‑1812); and Ludwig Spohr (1784‑1859) wrote 4 Concertos and various other solos for clarinetist Johann Hermstedt (1778‑1846). Carl Maria von Weber was no exception, he wrote his Concertino, Op. 26, Variations, Op. 33 (for clarinet & piano), Quintet, Op. 34 (for clarinet & strings) and 2 Concertos, Op. 73 & 74 for clarinetist Heinrich Baermann (1784-1847). He met Baermann in Darmstadt, in early 1811, while Baermann was on tour. Baermann was much more famous than Weber, and immediately Weber began writing works for Baermann. The Concertino (Op. 26) was first performed on April 5, 1811, in Munich and the Concerto No. 1 in F Minor (Op. 73) was first performed on June 13, 1811. When Weber returned from tour, he performed a Concert Rondo on November 11, 1811 in Munich, which he eventually used as the basis for the 3rd movement of Concerto No. 2 in Eb Major (Op. 74), first performed on November 25, 1811. Weber and Baermann toured together from December 1, 1811 to March 28, 1812. The Variations (Op. 33) was hastily written on December 3, 1811 for a performance the following day in Prague, when it was realized that they had no works for clarinet and piano, alone. Weber met Louis Spohr (1784-1859) and clarinetist Johann Hermstedt (1778-1846) at Gotha, while on tour with Baermann. It is probable that Grand Duo Concertant (Op. 48), written in Berlin at the end of 1816, was for Hermstedt because it bears no dedication (i. e., all of the other clarinet works were specifically dedicated to Baermann). The Clarinet Quintet (Op. 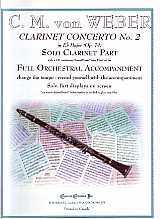 34) for Clarinet & Strings was begun in September, 1811 but not completed until 1815. It can be seen that the opus numbers in Weber’s works bear little resemblance to the order in which the music was written. From January 13, 1813 until September 13, 1816 Weber was director of Opera in Prague; on December 21, 1816 he became conductor of German Opera in Dresden. His most famous operas are Der Freischütz (completed June 18, 1821), Euryanthe (completed October 25, 1823) and Oberon (completed April 12, 1826) ‑ the first production of which he was in London supervising when he died (of tuberculosis). - Complete (All three movements) .